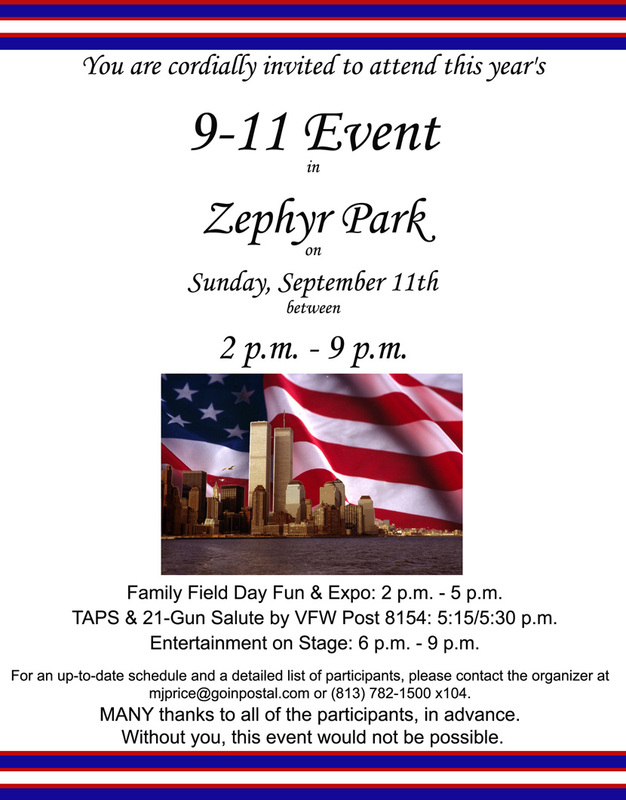 In recognition of the 10th Anniversary of 9-11 an event is scheduled for Sunday, September 11th at Zephyr Park from 2 p.m. to 9 p.m. This years event is a celebration of life, liberty and the pursuit of happiness and is 100% FREE. Keynote speaker will be State Representative Will Weatherford. Some of the activities include the Pasco County Sheriff’s Mounted Posse, a 21 Gun salute by VFW Post 8154, and performances by Arts in Motion. Several displays will be on hand like Pilot Ron Gallops Aerocycle, Fire engines, and several veteran and non profit groups. Visitors are encouraged to wear red, white and blue and will receive a gift while supplies last for dressing patriotic. This event was started in 2002 by Marcus and MJ Price and has continued every year since. All participants appear out of the goodness of their heart and are not compensated. This is a wholesome family event with kids games and activities for all ages. Plan to come out and support this great community event. You’ll be glad you did.